The intense competition between horse trainers Willie Mullins and Gordon Elliott, which has lit up the NH trainers championship in Ireland both this and last season, will move across the water next week as Elliott attempts to repeat his achievement of 2017 in dislodging Mullins from his perch at the top of the Cheltenham trainers' tree. 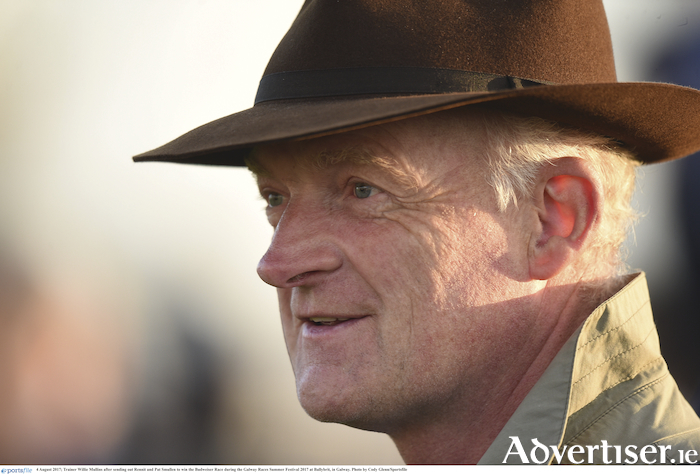 Mullins had been champion trainer at the festival for the previous four seasons, but the loss of some of his best horses through injury, and the departure of the Gigginstown Stud horses from his stables 18 months ago, left him looking a little vulnerable. Having led Mullins by more than €120,000 in prize money won with just two days left of the 2016/2017 NH season, Elliott was heartbroken when the master of Closutton staged a remarkable comeback to win the Irish NH trainers crown on the final day of the season at Punchestown. With a lead of more than €400,000 in prize money won at the time of writing, it will take another exceptional fightback by Mullins to prevent the Elliott yard from at last securing the coveted leading trainer title this season. However, there is the not insignificant matter of the battle of the Cotswolds to be fought next week, and Mullins is even money favourite to Elliott’s 5/2 to reclaim the leading trainer crown at the festival. Perhaps Nicky Henderson will spoil the Irish party, and keep the leading trainer award in the UK for the first time in six years. Buveur D’Air to double up. Tuesday’s opening race, the Supreme Novices Hurdle, looks a far more open affair than the betting suggests. Getabird may well win and is a worthy favourite, but this horse is no Vautour or Douvan, and does not appeal at the 5/4 that is now on offer. With running plans still to be finalised for many of those competing in the novice races, an each-way bet on Kalashnikov is the recommended wager at this stage. In the second race of the meeting, the Arkle Chase, favourite Footpad has been on the drift for the last few days. Assuming he turns up for this race, I expect him to lead to the first of many ‘Irish roars’ throughout the week. If he takes up an engagement later in the week, his compatriot Petite Mouchoir, should prove an able substitute. If the ground turns very soft, Saint Calvados would enter the equation. The Champion Hurdle is as close to a one-horse race as there will be at the entire meeting, and I expect Buveur D’Air to comfortably follow up last year's success. The Mares Hurdle has an equally short priced favourite in Apples Jade, and it is impossible to look beyond her. For those avoiding favourites, Let's Dance or Benie Des Dieux may be worth a small each way wager. The four mile NH Chase could be dominated by those highest in the betting, with a slight preference for Presenting Percy, if this is his chosen race: otherwise Elegant Escape, Jury Duty, and Dounikos will be the leading contenders. Coo Star Sivola, Any Second Now, and De Plotting Shed are three to watch out for in Tuesday’s handicaps. Wednesday’s highlight, The Queen Mother Champion Chase, sees Altior return to the festival seeking his third win in three outings. He will be very difficult to beat, but Min will give him plenty to think about. Sit back and enjoy this one. Another favourite expected to run well on Wednesday is Samcro in the Ballymore Novices Hurdle. At the likely odds, he is one for multiple bets only. Next Destination and On The Blind Side are likely to chase him home. The RSA chase may deliver another Irish-trained winner with Monalee the likely beneficiary if Presenting Percy takes up Tuesday’s engagement. Thursday opens with the JLT Novices Chase, and the first three in the betting all have previous engagements earlier in the week. If Footpad or Monalee are kept for this race, take the hint and have a few quid on. Sort It Out looks sure to run well in The Pertemps Network final, though Glenloe cannot be ruled out. Un De Sceaux is fancied in the Ryanair Chase, with the likely dangers headed by Waiting Patiently and Top Notch. Supasundae is the selected bet for The Stayers’ Hurdle, and should continue Jessica Harrington’s great run of form. Sam Spinner is a likely danger here. Laurina looks a good thing in The Mare Novices Hurdle with Stormy Ireland and Maria’s Benefit the likely dangers. Tully East, The Storyteller, Squouateur, and Mall Dini appeal as each way propositions in Thursday’s remaining handicaps. The Triumph Hurdle opens Friday’s card, and Redicean will be hard to beat. Apples Shakira will be a short priced favourite, but I strongly fancy Redicean as an irresistible each way bet at his present odds of 6/1. If funds are running low at this stage, and punters need a bit more value, look no further than Hunters Call as a good each way value bet in the County Hurdle. The Gold Cup looks very open this year and I expect the Jessica Harrington pair of Sizing John and Our Duke to be in the shake-up, along with English hopes Might Bite and Native River. Accumulator: Footpad, Buveir D’Air, Samcro and Laurina. Also: Redicean each way in Friday’s Triumph Hurdle.